Ever wonder you can have face & neck lifting with under needles & surgery? Let me introduce you! new Ultherapy treatment ! — without surgery or downtime. This treatment harnesses the power of ultrasound to deliver its collagen-boosting effect. 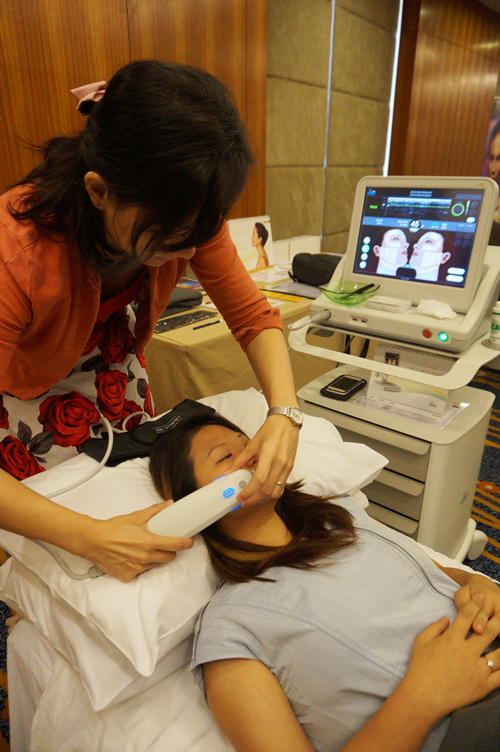 Unlike lasers, radio frequency, surgery and other technologies, non-surgical Ultherapy® bypasses the surface of the skin to deliver the right amount of ultrasound energy at the right depths and the right temperature. It is the only non-invasive procedure U.S. FDA-cleared to lift skin on the neck, under the chin and on the eyebrow. It is now also U.S. FDA-cleared to improve the appearance of lines and wrinkles on the décolleté. Surgical facelifts have evolved to target deeper tissue planes with less patient downtime. 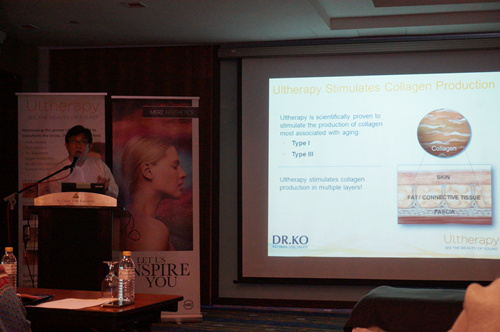 And now, Ultherapy® is the next evolution in aesthetic science. 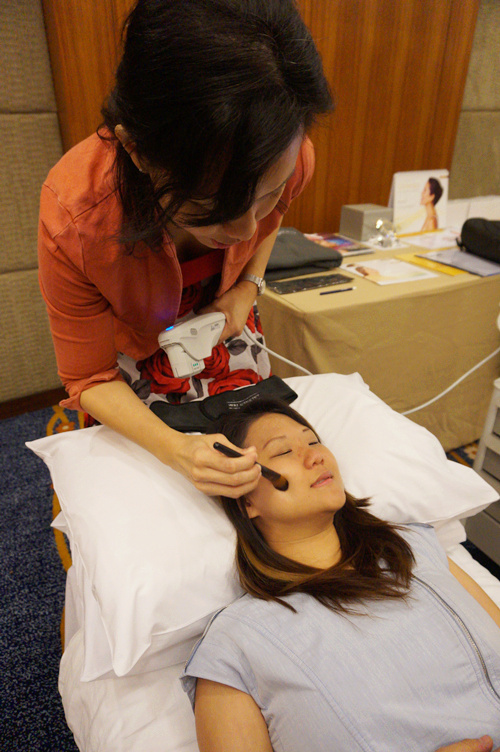 It delivers focused ultrasound energy to the same foundational layer typically addressed by surgeons during cosmetic surgery – without cutting or disrupting the surface of the skin. This energy initiates the body’s natural response to stimulate the growth of fresh, new collagen and strengthen weak collagen. Some patients see an initial effect right after their treatment, but the real results appear over 2–3 months as new collagen builds, gradually lifting and tightening skin on the face and neck and smoothing skin on the chest. While Ultherapy® does not duplicate the results of a facelift, it’s an exciting alternative for those who are not ready for surgery – and for patients who wish to extend the effects of cosmetic surgery. Cooling gel to be applied for before Ultherapy. Small tingling feeling on my the part Dr. spotted and no-pain at all! 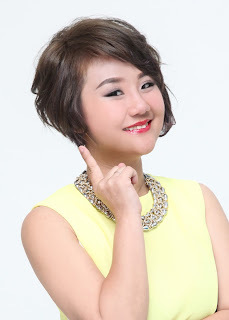 as the result is not instant but takes about 2-3 months to builds collagen. and I still really enjoy the soft massage with Ultherapy machine! This treatment is very safe and fast . 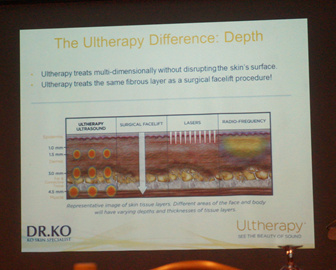 Interested to know more about Ultherapy ?